Munich - After a day-and-half of rest and recuperation on the back of their winter training camp in Qatar, it's down to the hard graft again for FC Bayern München on Thursday. There was certainly experimentation aplenty from head coach Pep Guardiola over the course of the camp's eleven training sessions and two friendly matches. Having opened 2014 with a 2-0 win against Sudanese champions Al-Merrikh SC, Bayern rounded things out with an 8-0 thumping of Kuwait SC in a stopover on the way home. The final score in that one notwithstanding, midfielder Toni Kroos rated it a “decent run-out” against the current AFC Cup holders - the Asian Federation's equivalent of the UEFA Europa League - above all in the first half, which ended with just a single goal separating the sides. On the tactical front, Guardiola used the trip to try out variations on a three- and four-man defence, one holding midfielder and two and a 'false'/'genuine' no9, among others. It was also an opportunity to give a bit of first-team experience to the up-and-coming likes of Julian Green, scorer of the second goal in Kuwait, Pierre Höjbjerg, Mitchell Weiser and Ylli Sallahi. Three regulars who missed out on the Kuwaiti leg of the trip were Manuel Neuer, Philipp Lahm and Franck Ribery, due of course to an appointment at the FIFA Ballon d'Or awards ceremony in Zurich on Monday. There was disappointment for France winger Ribery, who had harboured realistic hopes of winning the main award, but all three Bayern stars did make the FIFPro World XI. The Munich club went one better when the extensive UEFA.com users' Team of the Year was unveiled on Wednesday, with David Alaba joining the aforementioned trio in the line-up. The 21-year-old Austrian left-back took a knock to the knee on Sunday, but was fit enough to have a run-out in Kuwait the following day. 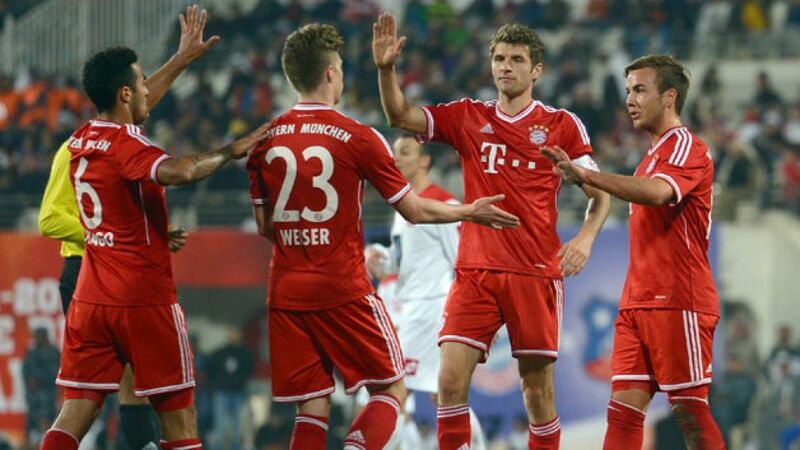 “The training's had a real edge to it,” skipper Lahm acknowledged. “It's been strenuous, but a lot of fun as well.” The final week of preparations will now be devoted to fine-tuning and Thomas Müller spoke for the collective in banishing any vestige of complacency: “Every team we play will perform out of their skins against us. There'll be no easy games.” No easy games, either, for those self-same teams against FC Bayern.